classjobs | Dude, Where's My Shelfwork? Classroom jobs are very important to helping students be responsible to the community of the class. My classroom jobs are by table so that students work together as small teams to help our class time run smoothly and make sure our environment is clean and inviting. Classroom Jobs help students be responsible to the community. This is our classroom jobs chart. Each of the jobs has a card with an explanation of what is expected. 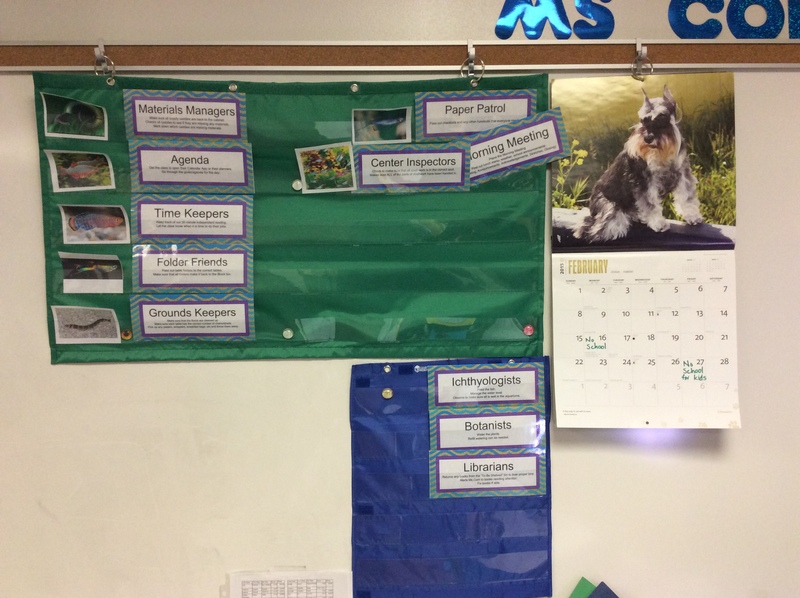 There is a picture that matches the fish picture on each table so that students can be reminded of which job they are to do. Agenda -in charge of reading the Goals/Guiding Questions and list of activities for the day. This is always interesting to watch when the students are deciding who will read it out loud to the class. Time Keepers -in charge of setting the timer for our 15/20 minute reading time. THey are also in charge of letting us know it is time to do jobs before the end of class. Folder Friends -pass out and collect the table folders at the beginning and end of class time. Grounds Keepers -make sure all of the tables are back in position and have 4 chairs/stools to sit on. Also, they make sure the floor is picked up. Paper Patrol -pass out checklists on Mondays and any other handouts needed. Center Inspectors -check to make sure shelfwork is put away properly and all of the pieces are there for each activity. Background for the cards is designed by Kindergarten Printables. You will notice that one of the large explanation cards is askew. This is because it this table’s job to host Morning Meeting during our Foundations class. There is no Center Work, so they don’t have a double duty, and don’t get out of having a duty that week. The card itself doesn’t fit very well in the pocket, but it just seemed to belong there. Ichthyologist -feeds fish and monitors water levels in the aquarium as well as letting me know if anything seems out of place…or we lose one of our finned friends. Botanist -waters the plants and refills the watering can when necessary. Librarian -it is their job to put books away that are turned in to the bin and repair any books that need attention. There is a different bin for those. Is this a perfect system? No, no it is not. However, the only real issue we have is the students need to be reminded to check their job changes on Mondays. Occasionally, the folder friends need reminding to pass out folders, they are usually very good at getting them back. My co-taught Special Education class need time to decide which student at the table is going to read, and sometimes a moment to practice/confer to make sure they know all of the words. That being said, my class knows reality, and is very patient with mistakes. None of us is perfect, but we are all better together. Categories: Procedures, Uncategorized | Tags: classjobs, middleschool, montessori | Permalink.